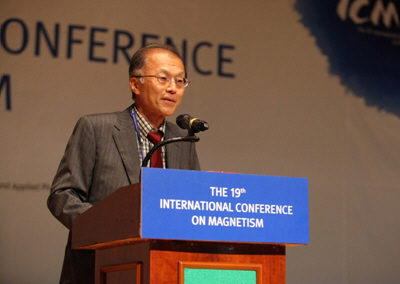 Prof. Maekawa, the director of ASRC, won the 2012 IUPAP Magnetism Award and Néel Medal with Prof. Tokura of RIKEN. This award and medal are presented by the International Union of Pure and Applied Physics, Magnetism Commission(C9). This award is one of the most authoritative one in this research presented field every three years. Néel Medal was established to commemorate a deed of Dr. Louis Néel who has created the modern magnetic physics. Prof. Maekawa's leading research on spin transportation and contribution to the basic theory on spintronics have been highly appreciateted. The award and medal were presented on 9th, July at Busan, Korea during the International Conference on Magnetism (ICM).